Play the role of a battle field commander in the great battles of the European theatre of World War 2. The Memoir '44 board game tries to simplify the WW2 war game genre to the point where almost anyone can play and enjoy the game. Rather than simply omit parts of battle, the system tries to "blur" the time-consuming detail and reveal the bare heart of the game. So instead of having to do lengthy calculations to determine troop movement rates, a quick rule lets you simulate their effect. Players of Battle Cry will recognise the game system immediately, but watch for the changes, such as the elimination of the deaded "useless cards". The game comes with 17 different scenarios included, and dozens and dozens more are available online, so this is a game that is always changing and offering new challenges. The simplified rules lets you concentrate on the tactics of the battlefield, and not worry about consulting rulebooks and looking up statistics on charts. Another important note: Eagle games has a special set of rules for multiple players with multiple boards. Check out their website here for reasons why you should buy more than one copy! The Memoir '44 board game comes with a clever double sided board which allows you to play both general terrain and beach-landing scenarios. The board is divided into the tesselated hexagon pattern we all love. (As a bonus, the hexagons go right to the edges so multiple boards can be chained together.) The board also has three sectors: a central sector, and a left and right flank. You choose a scenario from the 17 provided in the Memoir '44 rules or the dozens available online, and set up the board to match the starting conditions of the battle. Memoir '44 comes with terrain hexes you lay on the board. They indicate the hills, forests, towns, fortifications which make up the battle field for your scenario. Then the two players lay their infantry, armor and artillary units on the map as the starting map of the scenario indicates. Now it's time to get down to business. Each unit type has their own movement and attack characteristics as you would expect. For example, artillary can move or fight in a turn, but not both. Infantry can move up to two hexes, but can't attack if they move more than one. Players issue orders to their units by way of cards you draw and play (usually one per turn). These cards usually order a number of units (from one to all) in one, two or three of the sectors. For example a typical card would let you order 2 units on the right flank, or one unit in each of the three sectors. Your units can attack the opponents once they come within range and have a clear line of sight (unless it's artillary). Battle is conducted with dice rolling. The number of dice you roll depends on the type of unit and range to the target, and is modified by fortifications or terrain. Once you figure out how many dice, roll 'em and count the number of symbols which match your target type. That's the number of pieces killed in battle. Once a unit has all its pieces killed it's out of comission and the victor gets the last piece as a trophy (and victory point). And that's about it. Of course there are some numbers to remember about each units movement at attack abilities. And there are special tactics cards but they are pretty self-explanatory. Winning is accomplished by collecting the number of points the scenario requires. Sometimes this is strictly by killing enemy units, but other scenarios require you to take and hold (or successfully defend) terrain, such as a bridge or town. Once a winner is declared, turn the board around and play again, to see if you can do better as the other side! Who should buy Memoir '44? Well, the Memoir '44 board game is not going to be accepted as a serious war game by the grognard crowd. So some gamers will have to accept that and move on to the next game. If you deride Axis and Allies for its simplicity, this one isn't for you. Memoir '44 doesn't aspire to be a simulation of WW2. Rather it's trying to capture the feeling of commanding battlefield tactical warfare. Just the feeling, not the actual practice of it. But a change of focus might change your mind. Memoir '44 captures our imagination. Playing it feels like you really controlling the men's destiny with your choices. It's fun and pits you directly against your opponent in a battle of tactics. These are all good things, and in our opinion far outweigh the lack of simulation-quality detail. And if you're looking to start someone on their way towards more substantial war games, this is your pick. So many times we've read comments and reviews of people saying "Finally, my friend/girlfriend/wife/etc is playing a hexagon war game with me!" 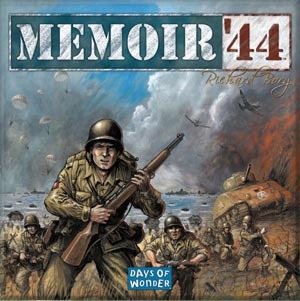 Memoir'44 is a unique historical game where players command a horde of little plastic Army men facing-off in dozens of WWII battles on an oversize hex game board.